First, let me apologize for my delay in keeping up with my blog. This time of year is always crazy busy in my job and there are many days where I don’t know if I am coming or going! I am sure many of you can relate. Each time I do another random act of kindness, I want to shout it to the world and celebrate the joy!! But alas, the reality of working full-time, being a mom, and keeping up with a non-stop schedule prevents me from taking the time to elaborate on each and every RAK I complete. But here I sit, looking through photos on my phone, carving out time to remember, reflect, and rejoice. Yes, rejoice! RAKs make me happy! How can I keep this all happiness to myself?! So it’s with that spirit that I will be posting several RAKs in a row. I was tempted to just lump them all together in one blog post (after all, that would be MUCH easier and quicker, too!) but I was reminded yesterday that EACH random act of kindness I complete is special and deserving of its own page. A humbling reminder that quick and easy isn’t always best. How exciting! And perfect timing, too, because I was STARVING and the kids were hungry, too. Perfect! I packed the kids in the car, drove to the nearest Subway, and delightfully placed my order. Normally I get something inexpensive like a 6 inch veggie sub, but today I decided to splurge and got a 6 inch chicken teriyaki, a drink, a bag of chips, the works! 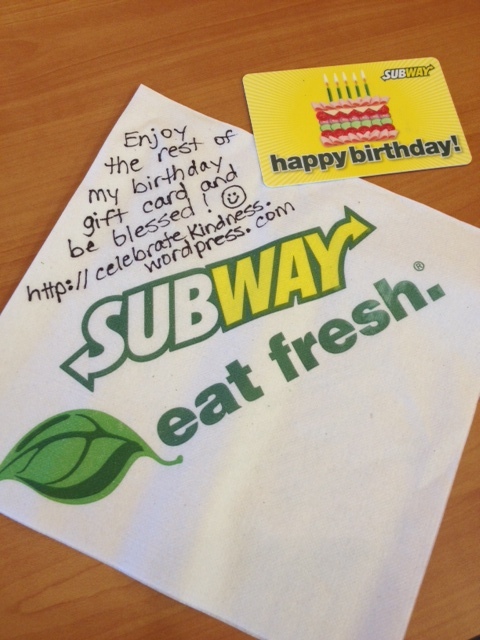 Oh, how fun to discover a forgotten gift card – it was almost like giving myself a RAK! Ha! After paying for my meal and my children’s meals, there was still a little bit of money left on the gift card. I decided to bless someone else with the store credit. I wrote a quick note on a napkin and asked the cashier to give it to the person behind me in line. It wasn’t a lot of money, only a few dollars, but I figured it could still be a blessing anyway. And, in a way, it was like sharing my birthday with someone else all over again! Fun! As I was grabbing napkins for the kids and putting straws in plastic drink lids, a gentleman about my age approached me with a smile on his face. He pointed to his bag and said simply, “Thanks so much. That was very nice!” Even as I watched him walk out of the door, his smile still lit up the room. Being kind doesn’t have to cost money and it isn’t always about 100% self-sacrifice. Sometimes I feel guilty when I do something for myself that I could have done for someone else instead. 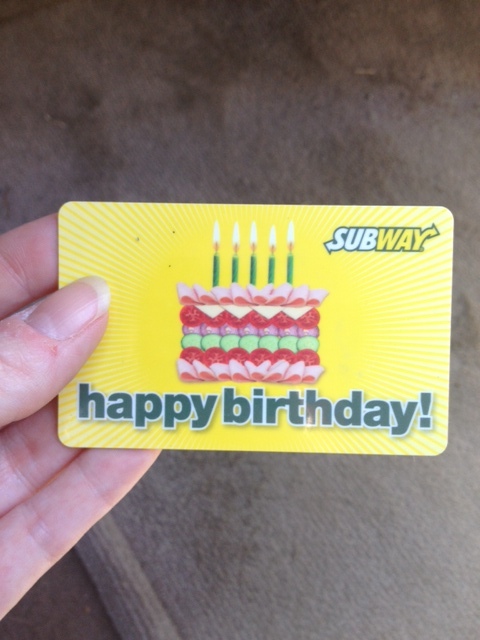 But this RAK reminded me that it’s OK to enjoy the generosity of others (my Subway birthday gift card) because sometimes there will be enough for two blessings instead of just one. Random Act of Kindness #8 is dedicated to Dylan Hockley, age 6. According to Dylan’s family, “his beaming smile would light up any room and his laugh was the sweetest music.” Seeing the smile of my RAK recipient in Subway was almost like catching a glimpse of Dylan’s smile, too. It simply warmed your heart and made you happy. I hope Dylan’s family will know that his memory, and smile, will live on through the random acts of kindness shown to others.